Have you heard of The DRx clinic? When I was 16, I started breaking out.. not really that bad but there are parts where my acne can't stop breaking out especially my forehead and right cheek!!!! I got really frustrated, I have seen like 2 different clinics to solved this issues, but apparently my main issues were clogged pores and inflamed acne! Both of these clinic didn't solved 50% of my acne however the products doesn't really suit my face and causes my face to clogged even more pores, I really really started worrying and hate myself whenever I see the mirror! Who doesn't want to own a flawless skin!?!?! I'm not blessed with flawless skin which I admit it. You can see how clean, simple and classy setting once you enter the clinic! I really love how the interior design settings, it really gives customers a clean aesthetic clinic/lab view. Greetings to you from the counter friendly nurses and that's where you'll be registering your own particulars! Around 2mins of waiting, they called up my name and off I go to meet Dr Hui Yan for the first time! While waiting for Dr Hui Yan to diagnosed my skin conditions, its quite sad because my face had gone worst back, yes I recently started breaking out REAL CRAZY!!!!! I don't know why but probably because I didn't watch my diet upon what Joycelyn said and yes, I realized that I have intake lots of dairy products. *Do try avoid Dairy products because they causes acne* So Dr Hui Yan briefed about my current skin conditions and decided to put me in the same skincare regime from what Dr Angela prescribed me as mentioned earlier on since there's no bad side effects. The consultations took about less than 15mins? Sleek and clean design of their makeup area, so for ladies who are insecure to leave the clinic with bare face, DRx has a room just for makeup!!! So don't worry! Waiting area for further treatments! Their new extension area for more treatments!!! I was told that last time they do not have this extension area. When you first step in the Medispa area, that's how it looks! After waiting at the counter, customers will be brought to their own spa treatments room! The prices are placed at the right-hand side of the payment counter, all prices of the products will include 7% of GST. I will do an explanation of my products below! The total products I have received! The prices I will state accordingly. Just pour a small 10cents size of the foaming cleanser and its more than enough for my whole face! I love how the cleanser smell!!! This cleanser is a hydrating cleanser for all skin types that contains optimal concentrations of Marine Algae extracts that gently exfoliates for a soothing and refreshing wash and also natural cleansing and toning, balancing the pH level of the skin! I LOVE LOVE LOVE THIS PRODUCT! Miracle product, I remember when I first used it, I can really tell the difference!!! Like what I've mentioned earlier, one of my concerns was black and whiteheads but with this, 90% of my problems are solved and the remaining dirt trapped inside needs to be extract out! This product is award winning product for reducing appearance of comedones. It contains botanical extracts which work to reduce the appearance of comedones. Another product I'm loving it! Blemish formula helps to reduce the occurrence of break-outs, it is an all-natural formulations to control and reduce the occurrence of blemishes and break-outs without any adverse side effects. After using, my nose and forehead is less oily. YES I have oily T-zone.... :-( and yes my acne did reduced, I can see the difference from my first consultation photos! Last but not least, the one that cures your angry pimples! I remember my first consultation, they prescribed me Acne Spot Lotion so apparently they ran out of ASL and replaced Blemish Gel for the cure of my Acne! So go away you angry pimples! It's my first time trying out this and I will not write any review for this yet, do stay tune for the next update on my third consultations with DRx! 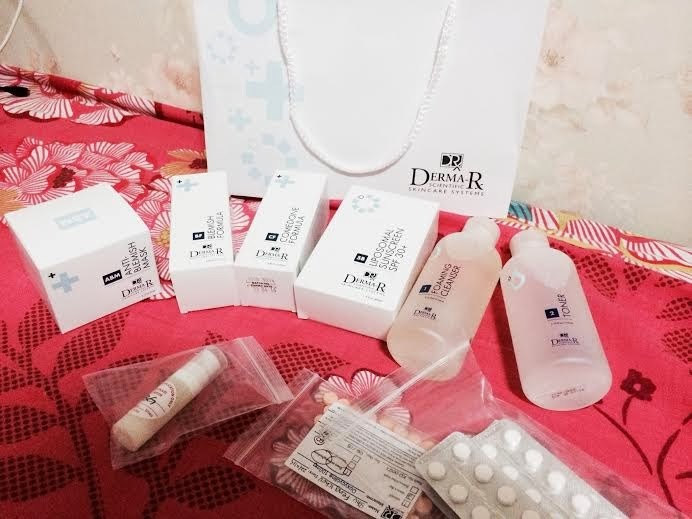 A big THANK YOU to DRx for the miracle products! You can book your appointment via online too! How much is the consultation fees? Hello, based on which doctor you'll be seeing. Usually it's $50 first timer and subsequently $35. Hi young lady, do you have any side effects after eating the pills? Hi Geraldine, So far not really however there will be a time when your period is irregular after taking the pills but it is still alright for me.